President Trump’s “America First” platform signaled a major reorientation from the past seven decades of American foreign policy: greater protectionism in trade, a new financial reckoning with our security allies, and a withdrawal from major international agreements. The 2017 Chicago Council Survey, conducted roughly six months into the new administration, tested the appeal of these ideas. The results suggest that, aside from Trump's core supporters, their attraction remains limited. 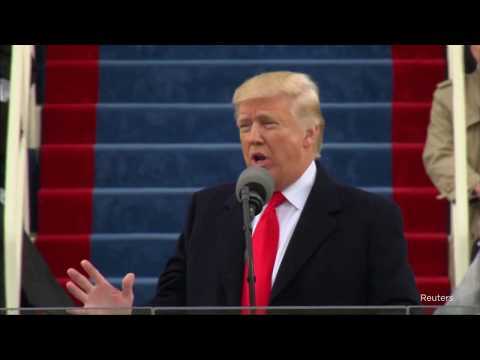 President Trump’s “America First” platform signaled a major reorientation from the past seven decades of American foreign policy: greater protectionism in trade, a new financial reckoning with our security allies, and a withdrawal from major international agreements. The 2017 Chicago Council Survey, conducted roughly six months into the Trump administration, tested the appeal of these ideas. The results suggest that their attraction remains limited. “CORE TRUMP SUPPORTERS” ARE THOSE IN THE SAMPLE WHO SAY THEY HAVE A “VERY FAVORABLE” VIEW OF US PRESIDENT DONALD TRUMP. THIS GROUP CONSTITUTES 21 PERCENT OF THE OVERALL SAMPLE; 62 PERCENT SELF-IDENTIFY AS REPUBLICANS, 31 PERCENT AS INDEPENDENTS, AND 5 PERCENT AS DEMOCRATS. President Trump has repeatedly criticized allies of free-riding on America’s security guarantee and argued that US alliances were not serving American interests. The president's specific concern with allies is a financial one. He has threatened to withold US contributions if other NATO countries do not meet their financial commitments. But the US public disagrees. Americans rate alliances as one of the most effective ways for the United States to achieve its foreign policy goals. As a candidate and as president, Donald Trump has criticized trade agreements for benefiting other countries at the direct expense of the US economy and American workers. The 2017 Survey finds that this message has clearly resonated with his base and with a portion of the broader public. But in general, Americans have begun to see the effects of trade on the overall US economy, consumers, and job creation more positively. Immigration was a central issue during the 2016 presidential campaign, and it remains a key pillar in Donald Trump’s America First platform. The anti-immigrant overtones of America First have struck a particular chord with core Trump supporters, but not with most Americans. The American public is less alarmed than last year by the potential threat of large numbers of immigrants and refugees entering the United States. The Trump administration has pushed back against addressing climate issues. 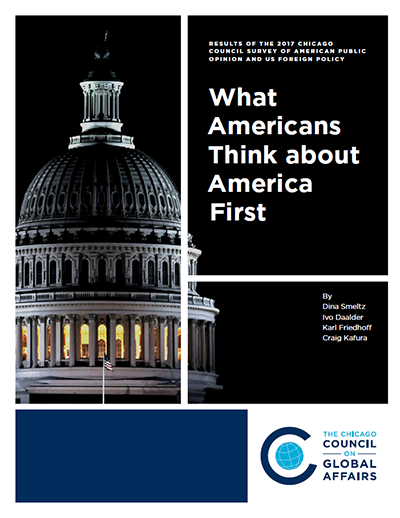 In June 2017, President Trump convened a press conference to announce the United States would “cease all implementation of the non-binding Paris Accord and the draconian financial and economic burdens the agreement imposes on our country” and instead “pursue a new deal.” But the 2017 Chicago Council Survey reveals that a majority of Americans continue to favor US participation in the agreement. Despite the politically charged environment over the past year, Americans express remarkably enduring support for an active US role in world affairs, for security alliances, and for trade relationships. They also favor offering illegal immigrants an opportunity to earn citizenship, either immediately or with conditions—a fact often overlooked by political leaders. Even though a portion of Americans have some questions about how much the United States gets out of security alliances and trade agreements, the American public as a whole seems to recognize clear value in maintaining them. To learn more, download the full 2017 Chicago Council Survey. The Chicago Council Survey, conducted every four years since 1974, biennially since 2002, and annually since 2014, is a trusted and widely cited source of longitudinal data on American public opinion about a broad range of US foreign policy and international issues. Learn more at thechicagocouncil.org.